These easy Christmas chocolate truffles are made with Christmas leftover desserts. You can use any leftover cookies or cakes you have to make them. It’s New Year’s Eve today and wanted to make a last post to thank all of you who have become my friends, through our common love, which is food. Even if we are scattered in the four corners of this small world, with some of you, we’ve met in person and I cherish this friendship even more. In the course of all these years, even if we haven’t met, I’ve learned so many things about your culture, food and traditions. Ι have realized over these years what a wonderful thing it is to have love and support from people I have never met but always hope that this day will come in the future. Some of you I’ve lost during the course of the year mainly because I was busy trying to write my cookbooks but also reach my goal of losing weight. I tried hard to visit back, may be not all the times because all your wonderful and delicious recipes were very tempting and I needed to stay away, in order to achieve that goal. The Christmas holiday period is one of the most difficult of the whole year and is the period I usually used to gain most of my weight. Like every year, this year as well I’ve made our favourite cookies and desserts. As usual, I made Kourabiedes, Melomakarona, Amygdalota, I made 2 chocolate cookies and I also made Kydonopasto (Quince Paste). I made a bigger batch for each of our traditional desserts, which I gave as gifts to friends together with a jar of my Mixed Citrus Ginger Marmalade and Citrus Spoon Sweets. We picked lots of citrus fruit from our trees and this time, I experimented using ginger and some other flavours. I used this Marmalade as well as some other Citrus Fruit Preserve in some of the desserts I made. As much as we love all these desserts, no matter how many we eat, there are always going to be some leftovers. Each year I always try to make good use of the leftovers by make something different. One year I dipped the Kourabiedes and Melomakarona in chocolate, another year I used them as a base for cheesecake, last year I used some in a Black Lava Orange Gateau. Due to the economic crisis in Greece, the new trend in Greece on T.V. food shows and magazines is showing people ways to use their leftovers and save money. I am glad that I was way ahead as I’ve been doing this for years. Some friends were coming over to visit us. Although I had most of the aforementioned desserts to offer them, I decided to make something new. At this time of the holidays, I now that they are probably fed up of eating Kourabiedes and Melomakarona. So, with all these leftovers, I decided to make truffles using some of the above desserts. I used a few melomakarona together with lots of leftover walnuts in the platter, some Kourabiedes and a large piece of Christmas cake. The Christmas cake has lots of fruit, nuts, raisins and spices in it and of course some almond paste and royal icing on top. To make them, I crashed and mixed up all these desserts and prepared a ganache which I mixed with the cookies. 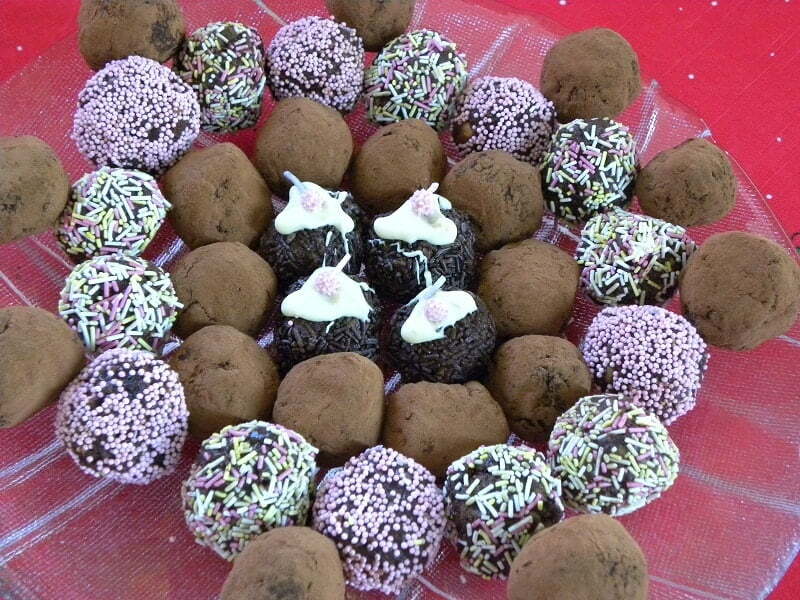 I then formed them into small balls and finally I rolled some in sifted cocoa and some in different colours of sprinkles. I even decorated some with sugar frosting. The taste and flavour was totally something amazing and new, which reminded none of the above traditional desserts. Try them next time and you will see how they will disappear in no time, as you surely cannot stop at just eating one! These truffles are an ingenious way to use up leftover kourabiedes, melomakarona, Christmas Cake, or Cookies. Melt the chocolate in a double boiler. Add butter and cream and mix until smooth. Crumble the cookies and cake. Add the melted chocolate and mix. (If the mixture is too runny, crumble some more cookies or ordinary biscuits or add a couple tablespoons dried breadcrumbs). Set aside for the chocolate to cool for about five minutes. Meantime sift cocoa and put the sprinkles in separate plates. (I used three different kinds). Using a teaspoon, scrape up some of the mixture, Using your hands form the mixture into small balls (approximately 3 cm / 1″ diameter) and lay them on a tray or parchment paper. When done, roll some of the truffles in the cocoa and some in the sprinkles. Set aside until the chocolate sets and become hard again. You can make them with any other leftover cookies or just plain biscuits (see older recipe below) and add roasted nuts, dried fruit, candy etc. If you are making them during summer, store them in the refrigerator. A great idea! Those truffles look divine. Best wishes for 2012! May the new year bring you joy and happiness. Yummy idea! Καλή Χρονιά με υγεία, χαρά και ευτυχία!!! E cumpana dintre ani! Sa privim inapoi cu iertare, inainte cu speranta, in jos cu intelegere, si in sus cu recunostinta! Un An Nou plin de bucurii si impliniri! La multi ani! Lovely truffles, Ivy! Happy 2012! You are so creative, I love it! Also, you gave me the idea for my latest post. I am going to reference you. All the best, Ivy!! Fillakia! The truffles look delicious! I can’t wait to delve into your cookbooks and discover all of these recipes – and maybe you will get me to try my hand at making preserves! It’s funny because I who grew up in a culture of abundance, my husband was raised by parents and grandparents who had suffered through two world wars and nothing was ever thrown away – which turned my husband into the king of creating new and delicious dishes with leftovers! So this post means a lot to me! Happy New Year, dear Ivy!